I take you, Big House, to be my stadium; and I promise before God and these witnesses to be your loving and faithful fan; in plenty and in want; in joy and in sorrow; in sickness and in health; until death do us part. In a move that will certainly be a popular one among about-to-wed die-hard Michigan fans everywhere, the Big House is now available for weddings and other private events. Not just "the hole that Yost dug, Canham carpeted, Crisler paid for, and Schembechler filled each and every Saturday " but other Michigan athletic facilities will be offered for private use as well. 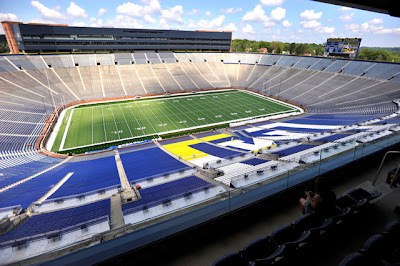 ANN ARBOR, Mich. – Are you interested in getting married at Michigan Stadium? Having a corporate event at the Big House or other athletic venues? Do you want to take special photos at the stadium? For the first time, the University of Michigan Athletic Department is offering you the opportunity to host your next event on our turf. Michigan Athletics offers many unique settings to host your next event. From weddings, meetings, luncheons, showers and banquet receptions, your next event will give a lasting impression to all guests with the history and tradition of the University of Michigan as a backdrop. Premium spaces available for rent include, but are not limited to, the Jack Roth Stadium Club, Regents Guest Area, Athletic Director’s Suite, Junge Family Champions Center, Michigan Stadium Press Box and the Golf Course Clubhouse. For our wedding clients, you can have your wedding at the 50-yard line of Michigan Stadium. In addition to rentals, guided tours will be offered through many of the athletic facilities. Michigan Stadium guided tours will guide guests through the Big House, including the field, game day locker room, press box and club and suite levels. The deluxe tour will include all elements of the Michigan Stadium tour as well as taking guests through Yost Ice Arena, the Wilpon Baseball and Softball Complex, Crisler Arena (construction permitting), Cliff Keen Arena and Schembechler Hall (if available). Photo opportunities at Michigan Stadium are also offered in one-hour increments. You can spend time in and around the stadium, as well as on the field. For additional information about holding your event with Michigan Athletics, contact Special Events Coordinator Katy Hepner at (734) 647-1261 or katjacks@umich.edu. Opinions are likely to be divided equally down the middle on this one, but honestly, I like it. From a purely financial perspective, any revenue that comes in from this venture is probably just enough to cover the costs of staffing said events. But the mere prospect of offering a one-of-a-kind facility that only gets used for roughly 8 days a year for anyone who is willing to ante-up only makes sense to me. Costs for facility rentals can be found here. Special tours, and photo ops are also available.